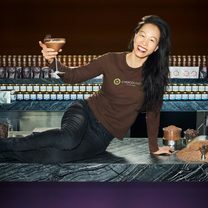 Patricia Tsai is the owner of the bean-to-bar chocolate company in Los Angeles, ChocoVivo. "Some say it’s European style, some say it’s Mexican style... either way sipping chocolates are a thick, dense, flavorful way to enjoy chocolate in an amazing jam-packed drink that you can slowly sip on with a good book or conversation 💆‍♀️😋 This particular one is prepared Mayan Style, meaning spicy & cinnamony! 👉 Follow: @chocovivo_la 📷 Credit: @usagibiker Thank you for coming in!" "A true ancient tradition: sipping chocolate. Thick, dense, packed with flavor! This is how it was enjoyed by Aztecs & Mayans centuries ago. No time machine necessary, just hop in our cafe to experience it! We even have flavor upgrades you can pick 😉 Open 7 days a week! 👉 Follow: @chocovivo_la"
"Too thick or JUST RIGHT? 😭 Who enjoys a thick, chewy-center cookie this? Or are the thinner, crispier ones the way to go? Either way... This looks INSANE. We're digging the fat chocolate chunks in there 😏 We often use 85% Mayan Tradition in cookie recipes to give an extra boost of cinnamony-spicy flavor! 👉 Follow: @savoringtheflavoring"
"They look SO good 🙏 We’re big fans of those 2 main ingredients: dark chocolate & tahini! Matter of fact, we have a Chocolate Butter made from organic cacao nibs blended with Sesame Seeds! Gives the chocolate spread such a great nutty taste especially with the cacao! 👉 Follow: @chocovivo_la 📷 Credit: @rachlmansfield"
"🙈🙉🙊 Chocolate Monkey drinks! 100% vegan - made with cacao powder, frozen banana, coconut milk, & vegan white + dark chocolate! So cute! Great work @naturally.jo! New item at our cafe? Lol 👉 Follow: @chocovivo_la 📷 Credit: @naturally.jo"
"Who’s down for a Frozen Hot Chocolate?! Hot Chocolate is awesome, but when the sun is shining mid-day it’s even better blended with ice cream 😉🙏 Try the Mayan Spice one for a suuuuuper yummy flavor! 👉 Follow: @chocovivo_la"